Andrew Toth/GettyErika Nardini, pictured above, is not apologizing to anyone. 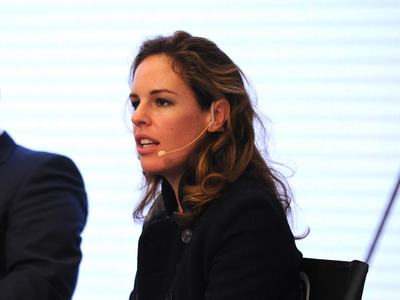 Erika Nardini is the CEO of Barstool Sports, a digital media company valued at $US100 million. Barstool Sports is often controversial, and some have called it sexist. Barstool Sports is a somewhat controversial website. The digital-media company, which was recently valued at $US100 million, is known for its coverage of news, sports, and girls. Recently, ESPN dropped Barstool Sports’ TV show after one episode, after star anchor Samantha Ponder tweeted screenshots from Barstool articles published three years earlier that made sexist remarks about her. For one, she said, “it’s very convenient to judge the past by today’s standards.” Nardini – who said she doesn’t get involved with the editorial side of the business – said Barstool Sports’ content has undergone an “evolution” in that it doesn’t make those kinds of sexist comments anymore. “I spent much of last year thinking about distribution and what would Barstool look like and sound like and do on other people’s air, whether that was a digital company or social network like Facebook or a comedy channel like ‘Comedy Central’ or sports channel like ESPN. We spent eight months working that ESPN partnership, and I poured myself into that. It was uncomfortable along the way. Culturally, Barstool and ESPN are just very, very different. I think there are great people at both companies, but ultimately it was an uncomfortable partnership. I think that what’s unfortunate about what happened is that it was never about the show, and the show itself was great. That was heartbreaking. “Dave and I were talking about it last night, oddly. We both agreed that if it were all to play out again, would we have done it? We both said yes. The reason I say yes is that morale at Barstool Sports – I don’t think has ever been as high as the day after that was canceled, and everyone came together, and I think I’ve never seen anything like the Stoolies and what they did to rally around the ‘Pardon My Take’ guys and around Barstool at large. “In terms of the controversy, I think ESPN has some challenges, and one of the challenges is that they have super-empowered talent. Sam had a three-year grudge and she played it and played it well. I don’t think that you can change the past, and if I came into Barstool apologizing for every time Barstool offended someone over the last 14 years, I basically would not do anything else in my job, but I don’t believe in that. “I don’t think that’s what I should be doing and that is certainly not what I came here to do. My feeling is it’s my job to harness what we bring to the table and deliver something that our crew wants and to find new people to be part of our crew. That’s not to say we won’t do future television deals or content partnerships or licensing agreements, but I do think we will be far more judicious in it. “I want to make sure that as our company we’re sure about what we’re doing and then we also, second, we choose other platforms and companies – like Sirius is an awesome partner for us that understands that being outspoken means and having a take means somebody’s not going to like your take. Letting us be the type of creators that we are and helping us to find more fans for that.